Before the days of the internet, tax research was conducted by tax professionals with access to information not readily available to the general public and followed high editorial standards. Corporate tax executives might have challenged the conclusions of the research, but they did not have to think twice about the validity of its sources. Today, internet search engines like Google give easy access to an almost infinite amount of information. Taxing authorities provide direct online access to primary source content. Law firm and accounting firm websites are full of articles written by tax professionals on a vast array of topics. White papers abound, most advocating particular positions. And let’s not forget about tax bloggers. 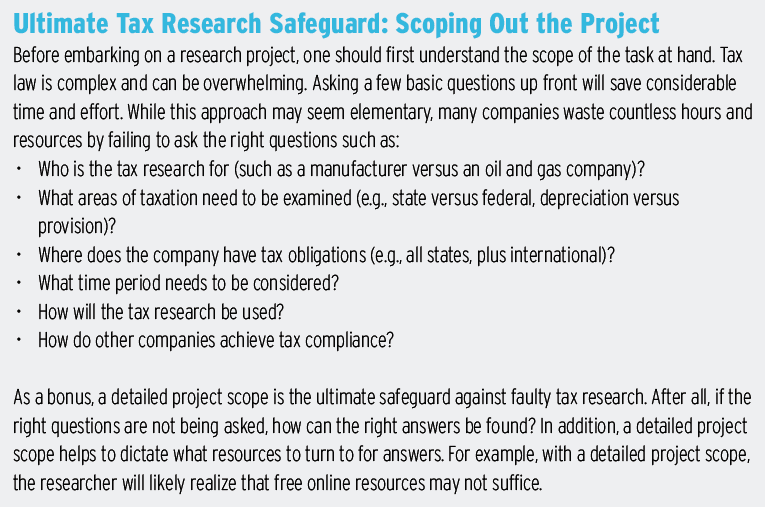 Access to free online resources has sparked a sea change in the approach to tax research. Companies can now use these resources to conduct their own research. But are they the most efficient use of limited time and labor? Is online information current, or accurate? And, most important, does it offer the best results? Much like free medical websites, free online tax resources might be useful when researching simple questions, but relying on a free online medical resource for a serious health issue could be profoundly dangerous. Similarly, sole reliance on such resources for tax research could pose personal, professional, and systemic risk to companies and their bottom lines. This article explores how corporations and firms can establish tax research guidelines to ensure the integrity of the tax research they rely on for making critical business decisions. Fast, free data seems like the ideal solution to keep track of the dynamic and ever-changing landscape of tax law. At first glance, this premise makes business sense. Why pay for something like tax research when you can get it for free? No doubt, there are many advantages of having access to so much information. Broad internet searches can find quick answers to simple questions, such as a basic tax rate, or to gain a baseline understanding of a subject. Such searches, however, often result in many hits, and wading through them can be cumbersome. For example, a search for “like kind exchange capital lease” on Google returns more than half a million hits. Just as important medical decisions should not rely on free online resources, the decisions regarding your company’s finances should draw from comprehensive, expert-vetted materials. For issues that go beyond the basics, which arise frequently in tax law, researchers would benefit by having access to curated, organized, well-referenced, reliable, and current information. Moreover, the insight of an experienced practitioner’s wealth of knowledge is invaluable. Given enough time, an internet search might help you to find the needle in a haystack, but you’d certainly find that needle faster if a tax expert showed you where to look for it. A tax expert can also tell you if you are looking in the right haystack—not to mention whether the needle was the right one for your purposes in the first place. Online searches are not always reliable. An internet search will likely yield a wide variety of results. Google, for example, simply presents the findings that rank favorably according to its algorithm. Google does not discern whether the research is unbiased, accurate, verified, written by a reliable source, or current—all factors critical to achieving tax compliance. Making a business decision as important as tax strategy should not be left to chance. Not all searches are created equal. Search results are only as good as your search query. If you search for a particular case with a unique name, you are more likely to find relevant hits. Searching for terms that are more generic, such as earnings and profits, will clearly be more challenging. Tax authority information doesn’t allow for tax planning. By the time a taxing authority puts information to paper, the tax law is likely already in effect. A tax executive relying solely on direct tax authority data for tax research will have little or no time for tax planning. Before a tax change or new ruling becomes law, taxpayers are typically given ample notice of impending changes. Staying ahead of tax law and having compliance mechanisms in place prior to tax laws’ coming into effect are critical for achieving tax compliance promptly and effectively. 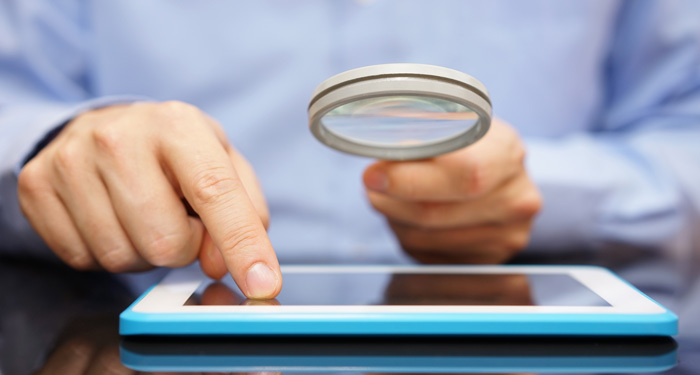 Free online research can compromise financial statement integrity. The lack of tax planning capabilities inherent in the use of free tax research has a profound effect on tax provision. Without the ability to anticipate the impact of upcoming tax laws, it is impossible to calculate tax provision. Inaccurate tax provision equates to an inaccurate balance sheet and puts financial statement integrity at risk. Tax law is not black and white. Access to regulations direct from a taxing authority may provide the details of the law, but, as any tax professional can attest, tax law is not black and white. Tax authorities often allow taxpayers to petition tax appeals or request letter rulings. In addition, primary data sources are not analyzed, nor is there a discussion of cases or practical examples showing real-world applications of the tax law. For example, if a taxpayer wants to know what tax incentives are available to recruit and hire topnotch employees, a Google search for “employee hiring incentives” yields very different results compared to a similar search within a tax research database. A Google search will be purely algorithm-based, whereas a research service search will provide specific guidance. Free tax research is more time-consuming than it seems. Conducting tax research online may seem fast and easy. But that notion could not be farther from the truth. For example, consider a tax executive at a manufacturing company charged with planning for the impact tax reform may have on his company and its bottom line. His team turns to Google in its first attempt to understand the implications of tax reform. 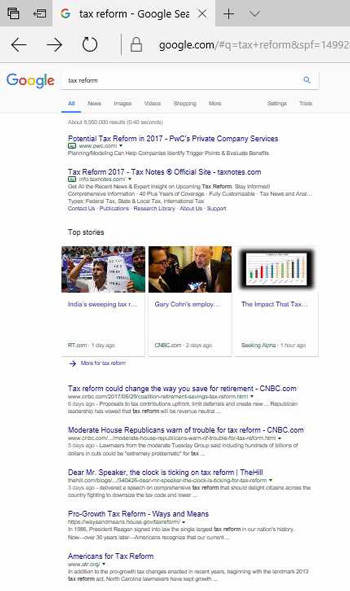 An online search for “tax reform” yields eleven results from sites owned by CNBC, The Hill, Ways and Means Republicans, Americans for Tax Reform, Seeking Alpha, the Atlantic, the Council on Foreign Relations, Forbes, Politico, and the Washington Post. The articles mostly debate the pros and cons of tax reform. The tax executive would have to wade through eleven articles before discovering that none of them provides insight into how the tax executive can effectively plan for tax reform for his company now or in the future. Secondary Sources: Fake News or Reliable Resource? The importance of high-quality tax research is clear. Tax advisors and corporate tax professionals want to serve their clients or company by providing the most accurate and advantageous tax advice that minimizes their tax liability. While some penalties can be avoided by demonstrating “reasonable cause” due to reliance on the advice of a tax advisor, certain responsibilities—such as filing on time—are the taxpayer’s alone, and reliance on a tax advisor is not reasonable cause for avoiding a penalty. See, for example, United States v. Boyle, 469 U.S. 241 (1985). In high-quality tax research, secondary sources (i.e., legal commentary and analysis) play a critical role. Secondary sources offer an understanding of the interplay of various primary source documents and point out what remains unclear. For example, how does a court’s decision on a specific factual situation affect similar, but different situations? Understanding the logic underlying court decisions helps to answer that question. Of course, the internet is rich with commentary. Some of it may be exactly on point. But how do you find it? How do you know what you find is trustworthy? And is it current? Does the research include references, and is it supported by regulations, statutes, administrative determinations, and case law? Are the authors experts in their fields? Do the authors offer unbiased opinions, or do they advocate particular positions? Does the research offer an alternative opinion or outline the risks of a position? Has the research gone through a formal editing process that includes legal review? Do the authors offer or refer to additional articles on the topic? Is the research timely and current? Is it maintained and updated? Does the research meet key criteria for quality such as accuracy, usefulness, understandability, and expected market impact? Is the research actionable (e.g., is it integrated with other research tools that help you meet your deliverable such as a research memo, a client letter, or a detailed plan)? Does the research offer ways to digest the information? Does the research offer guidance on how to get additional information on the topic? It is certainly feasible to cobble together all the components of sound research through free online resources, but the reality is that it will not really be free. To produce the type of research required to make strategic tax decisions with bottom-line implications, a company needs to invest significant operational resources. Plus, without internal protocols or safeguards to validate and maintain the research, the accuracy of the research will always be in question. Timely, accurate, and sound tax research has financial value. Just as important medical decisions should not rely on free online resources, the decisions regarding your company’s finances should draw from comprehensive, expert-vetted materials. For high-quality research that creates certainty and reveals planning opportunities, it’s best to consult a curated, trusted research system that provides access to thorough analysis that is constantly updated to incorporate the thousands of tax law changes that occur yearly. To make strategic tax decisions, executives need actionable data that often goes beyond the exact language of the law or regulation. Reliance on free online resources and search-engine surfing for tax research can be profoundly dangerous and poses personal, professional, and systemic risks to companies and their bottom lines. As a result, it is imperative that tax professionals put safeguards in place to ensure that their tax research is of the highest quality. George Farrah is the editorial director of Bloomberg BNA Tax & Accounting.